What the pros think of iPad Pro: is it something that every creative wants? It’s Apple’s biggest ever iPad, but has the Pro won over the creative professionals that it’s aimed at? In the months-long run up to Apple's 9 September 'Hey Siri' event, there was one rumour that just would not die a quiet and dignified death: that Apple was working on a gargantuan 12.9-inch tablet christened the 'iPad Pro', designed for creative pros and replete with stylus, the bane of one Steve Jobs. “If you see a stylus, they blew it”, he famously quipped. Apple must have a short memory. The inclusion of the pressure-sensitive stylus – or Pencil, as Apple has imaginatively named it – suggests the Pro is aimed squarely at illustrators, artists and designers – those for whom a trackpad or mouse are just not accurate enough. But what do those who work in these professions think of the oversized tablet? Will it become a must-have tool for the busy creative, or a rare stumble from a company that is not accustomed to making mistakes? And furthermore, should creative types really consider getting one? To get to the bottom of the issue once and for all, we asked a group of creative professionals to find out exactly what they thought of what Tim Cook called “the clearest expression of our vision of the future of personal computing”. The iPad Pro was the worst-kept Apple secret since every other product Cupertino ever launched. We all knew it was coming, but that didn't stop us getting excited for its 12.9 inches of pressure-sensitive, Retina‑flaunting, power-packing glory. That's all well and good, but outside of the Apple event bubble, what do creatives think of it? For Adam Dewhirst, Senior 3D Artist at The Mill, it's all about the portability. “I think its screen resolution coupled with its weight and portability are its most appealing aspects”, he says. “It's the right size for digital art and it's incredibly easy to just grab and go for a device that size. By comparison, the Wacom Cintiq Companion is over double the weight and much bulkier”. 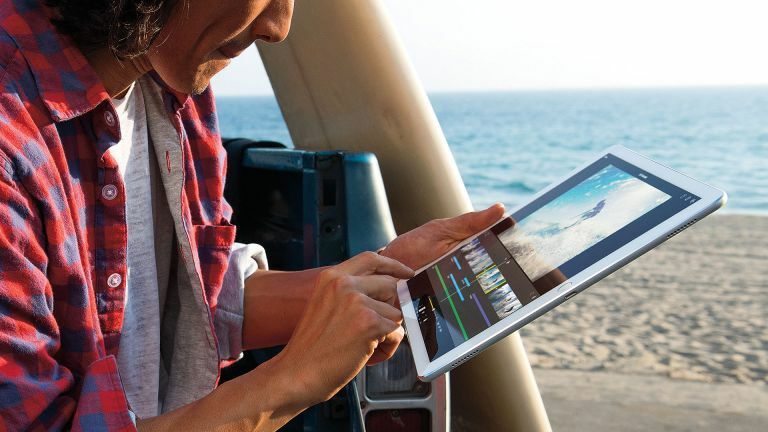 That is one of the most interesting reactions to the iPad Pro among creatives – every artist and designer we spoke to agreed that Apple was right to finally reverse its long-standing opposition to digital drawing implements. Rob Redman, CG artist at Pariah Studios, was typical of this response, arguing that it is about Apple responding and adapting to a world it has had huge influence over for so long. “There is nothing wrong with sticking to your guns to an extent”, he says, “but the world is a fluid, changeable place and the market will dictate what users want. Jobs was pretty good at predicting and even shaping things but there is definitely room for a stylus input”. “It's something that's been lacking from Apple products”, adds Dewhirst. “If anything I think I'm more interested in the Pencil than I am the iPad Pro itself”. Lockertsen puts it another way. “If you ask a painter if he [would] rather use a painting brush to work with or a finger, any artist wants to use a stylus”, he argues. “We grow up with crayons and pencils. Painting with a finger works, but it is not natural for us. And pressure sensitivity is something every artist wants”. Steve Jobs may not have been a fan of the stylus, but he was speaking of technology that was nowhere near its potential being used on fledgling smartphones a tiny proportion of the size of an iPad Pro. The Apple Pencil will be used in a totally different context by a totally different user base – a user base that seems to be very keen on the idea. Redman agrees, arguing that the iPad Pro just isn't ready to replace his desktop computer yet. “The iPad for me is a tool for travelling with”, he says. “I can't see a time when my 3D work will go mobile but for sketching [and] blocking out storyboards, it could be perfect”. Justifying the price tag remains a key hurdle for Apple. While the iPad Pro comes cheaper than many of Wacom's Cintiq tablets, it also lacks the flexibility of its rival's products. Cintiq supports Windows, which allows it to run fully-fledged graphics software like Adobe Photoshop. The iPad Pro, in contrast, runs iOS and is therefore limited to the apps that are available on that platform. That in itself is enough to put many people off. For all Apple's talk of the iPad Pro being a device for artists and creatives, iOS is the elephant in the room. That precludes the use of apps like Photoshop and ZBrush – key tools for artists in their droves. For Dewhirst, that's a deal-breaker: “It's a nice tool for remote working to a small degree... but could I do the same level of work I would normally do in the office? No”. “The trouble is more to do with software than anything else. I just can't do what I need with the current range of apps compared to the range of ability of something like Autodesk Maya”, he adds. What could fix this issue? In Dewhirst's opinion, shipping it with OS X; without that, it's not a viable option for him: “Ultimately, if I'm looking for a mobile tablet device and I have a choice between this and, say, the Surface or the Cintiq, I'm not going to pick the iPad. It can't compete because it's not able to – simple as”. That isn't an issue for Redman because he doesn't envisage using an iPad Pro for heavy duty work: “I'm not really interested in taking a full Windows machine round with me. I'd feel too much like I was in the studio and need to do heavy lifting work. [It] kind of defeats the point of [the iPad] for me. “I like the fact that iOS devices are lightweight, in both OS as well as hardware”, he reasons. While the iPad Pro could potentially compete with the Surface Pro, Microsoft's tablet is a “different beast”, according to Redman. As Apple's global stature grows to ever more dizzying heights, the company is finding it increasingly difficult to keep its new products and projects tightly under wraps. Few were surprised by the iPad Pro's announcement. But perhaps we shouldn't have been anyway – Apple has appealed to creative professionals for so long that it was surely a matter of time until it dipped its gold-encrusted toes into the fertile springs of the graphics tablet market. But for all its creative street cred, perhaps even Apple can't count on the iPad Pro's inevitable success. Our artists offered mixed support for the supersized slate – while there was much support for the effort, for some the device just isn't an essential tool. There was a sense among them that the iPad Pro is still a work in progress, something for the storyboard rather than the showreel. So should you get one? If you're creating work on the fly and use an iPad already for much of your creative output, then yes. But if our artists left you less than convinced, it may be best to wait for further developments – and see what Apple surprises us with next. Read more: iMac with Retina 5K display: has Apple created the ultimate all-in-one?